Harouna Samake, long time Kamale n’goni player for legendary Malian musician Salif Keita, is releasing his anticipated first solo album, Kamale Blues, in August, 2018. Recognised as Mali’s foremost Kamale n’goni player, Harouna has a long history of award winning musical collaborations. He arranged and recorded on five of Salif Keita’s albums and has also recorded on more than 50 albums with artists including Blick Bassy, Djessou Mory Kanté, Etienne Mbappé and Bassekou Kouyate, to name a few. On his new solo album, Harouna employs his talents to reflect upon issues present in the world around him. His lyrics are the foundation for this conceptual approach, referencing themes of immigration, wealth & inequality, gender relations, and human rights. 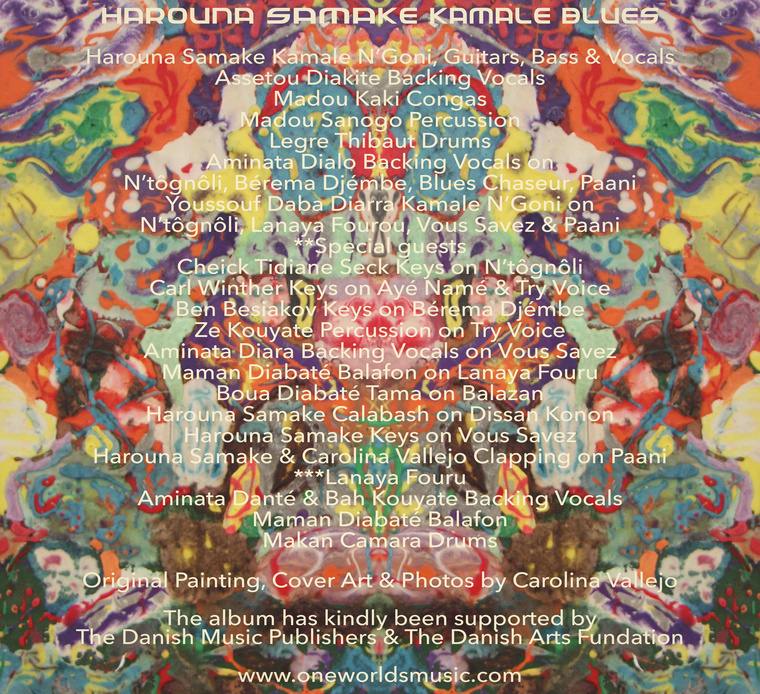 Sung mostly in his native Bambara with some English and French phrasing, Harouna’s album mixes various genres – from manding styles, to jazz and blues. His sound is unique, groovy and full of lawyers of tradional Malian arrangements with comtemporary ideas and strong solos. The chorus are song with the soft angelic vocal of his wife, Assetou Diakite that contrasts Harounas soft yet somewhat 'raw' voice. His career as a Kamale n’goni player started from humble beginnings. He fell in love with the instrument at the age of eight when he first witnessed a performer play in his small village in Mali. He collected a calabash, a branch of wood and found some strings. With help of a master, who gave him an old antilope skin, he constructed his first Kamale n’goni by hand, and perfected his musicianship while working on his family’s arable lands. Over the subsequent years, his style and abilities have impressed many internationally acclaimed artists such as Bonnie Raitt, who he jammed with at Festival au Dessert, Mali, and gave him his first electric guitar as a thank you, and Bella Flick, with whom he recorded 2 albums. After eighteen years touring internationally with Salif Keita, Harouna is ready to use his exceptional talents as a musician, composer, arranger and producer to marvel a whole new global audience of listeners through his exquisite full-length album, produced by Harouna Samake & Carolina Vallejo, One World Records 2018.